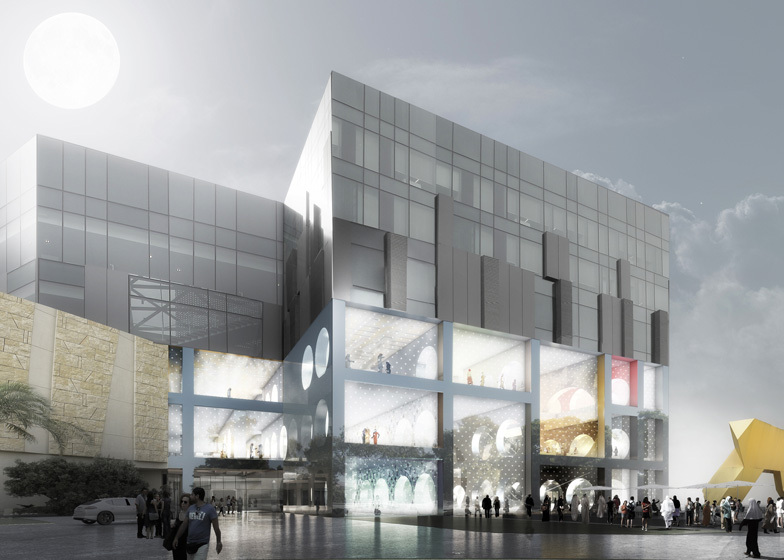 OMA has revealed designs for a department store in Kuwait City that draws inspiration from the galleries of a traditional Arab market. The Exhibition Hall project, led by OMA partners Rem Koolhaas and Iyad Alsaka, proposes a three-storey shopping centre inside the existing 360° Mall and will include a public events space as well as shops. Retail galleries will be laid out in long passages like a historic souk and will be divided using partitions with circular cut-outs. Each floor will be naturally lit and the entire store will feature a translucent facade. Construction is set to begin in 2014, with completion scheduled for later the same year. Foster + Partners worked on a similar concept for The Souk shopping centre in Abu Dhabi, which combines high-end boutiques with independent local food and craft markets. OMA also previously developed a masterplan for a new mixed-use quarter in Kuwait City. Other projects in the Middle East were outlined by Iyad Alsaka in an interview we filmed at the studio's exhibition at the Barbican in London. See more recent projects by OMA, including plans for a new skyscraper in Shenzhen. Photography is by Frans Parthesius. OMA is designing a new department store concept in Kuwait City. The Exhibition Hall, in the popular 360° Mall, will showcase the creativity of the region alongside international fashion brands through a flexible curated retail space, featuring cultural programs, exhibitions and installations. The project is led by OMA partners Iyad Alsaka and Rem Koolhaas, in partnership with Tamdeen Real Estate Co. The Exhibition Hall, as both department store and public event space, aims to re-establish the historic Kuwaiti connection between culture and commerce to form a contemporary public forum for the city. Comprising 9,400m2 over three floors, the Exhibition Hall will be suffused with natural light during the day, and present a glowing aspect to the street at night through a new translucent façade. A series of galleries – reminiscent of the long passages of the Souk – will introduce a space which brands can develop as they wish. Multifunctional partition walls with circular cut outs will accommodate transversal access and offer exciting shifting views. Within this polymorphous environment customers will discover curated galleries devoted to cultural events. The Exhibition Hall continues OMA longstanding interest in inventing new possibilities for retail spaces, which includes the Prada Epicentres in New York and Los Angeles, department store boutique designs for Viktor & Rolf and Coach, and an exhibition on the history of Galeries Lafayette in Paris. The project is developed with Kuwait’s 360° Mall management, Majed Al-Sabah and Giacomo Santucci, and overseen by OMA project architect Alessandro De Santis. Construction is scheduled for the beginning of 2014 and will be completed within the same year.